Until recently, the history of lobotomy has been linked to psychiatry. As noted in several studies, lobotomy was frequently employed in the treatment of psychiatric patients who had been hospitalised for years. Lobotomy/leucotomy was introduced by Egas Moniz in 1935, and soon became used by psychiatrists in various countries. In Denmark lobotomies were performed on a large scale. More than 4,000 psychosurgical operations were carried out during the period 1939-1956. With a population of only 4 million Danes in the late 1940s, this is an extremely high number of lobotomies. As a comparison, approximately 20,000 lobotomies were conducted in the U.S. in the same period. However, Danish lobotomies were not only used on psychiatric patients but also on mentally handicapped people. At least 300 mentally handicapped Danes had the operation between 1947 and 1983. 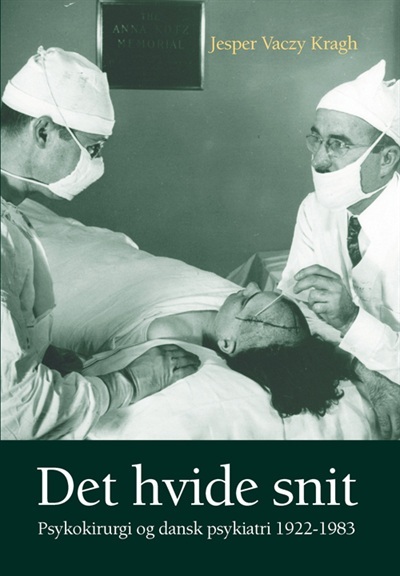 These are the main results from a book written by Jesper Vaczy Krag and entitled Det hvide snit (The White Incision). The author, Jesper Vaczy Kragh, is very interested to know if mentally handicapped were lobotomized in other countries so please do not hesitate to comment this post. This is a lurid but important subject for study. I presented my research here on my website: http://clarespark.com/2009/11/16/when-lobotomies-cured-the-romantic-agony/. What was considered conduct suitable to lobotomy takes its place as following from the Terror-Gothic literary movement of the late 19th-early 20th century. A postscript to my previous comment. Lobotomies were performed on more than the “mentally handicapped” as my blog demonstrated. Much of the diagnostics were directed against women who balked against excessive housework or were “anxious”. I have one example (case 123, Freeman) where a man who was appropriately puzzled by paradoxes (double binds?) was lobotomized, and turned into a cursing machine, but declared “cured.” (This case is illustrated elsewhere on my website.) A nice allegory for today’s political culture.